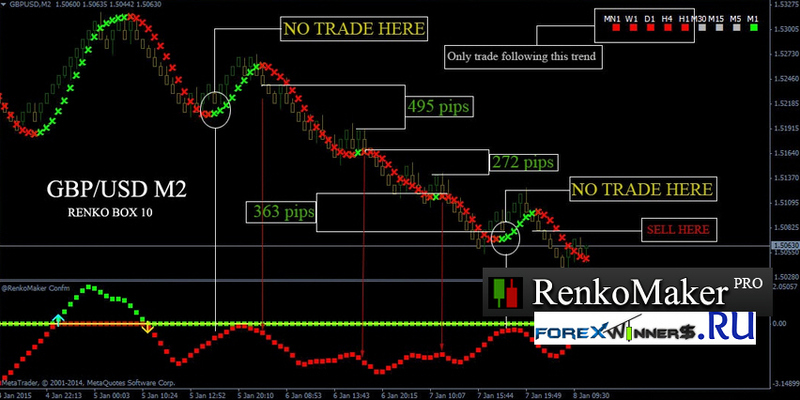 The System is based on a Renko Chart that predicts the price micro trends with amazing probability! In our opinion this trading tool works better than all other system that we’ve tried because it uses a brand new trading algorithm and micro trends determination system! The main principle of the indicator is a custom trading indicators composite + micro trend indicator + price action false signals filter – All in one! The “RenkoMaker pro” will print color arrow and trend informer directly on yourcharts, plus, you will get a popup alert and email alert whenever there is a new trading signal. The hit rate of the system is up to 90+% in most currencies if you follow our recommendations! Renko (derived from the Japanese word “renga” or brick), is based on movements in price and not time. There must be a particular size of movement or the chart ignores it. Renko charts predate the traditional PPS chart and were developed at least four centuries ago. Grounded in the “Renga”, the Japanese word for “brick”, Renko charts present a representation of the PPS movement not unlike a swing or three line break chart. Unlike swing and three line break charts, the OHLC format is replaced by “bricks” which indicate the “trend” while filtering out small variations from the trend. In classical Renko charts, not subject to tricks mentioned later, a brick is drawn in the direction of the prior move if and only if the securities price moves with a particular strength/magnitude; with a strength/magnitude indicated by the brick size. Only when the price moves at least one brick size will the Renko chart add a brick — even if it takes several days to generate such a movement! Thus, Renko charts ignore time and track ONLY the movement of the price regardless of how long it takes to register a change of sufficient magnitude/brick size. The construction of the chart is simple — If prices move more than the Brick size above the top (or below the bottom) of the last brick on the chart, a new brick is added in the next chart column. Hollow bricks are added if prices are rising. Black bricks are added if prices are falling. Only one type of brick can be added per time period. Bricks are always with their corners touching and no more than one brick may occupy each chart column. (Note: Some people use this coloring scheme, but others use customs colors.) It’s important to note that prices may exceed the top (or bottom) of the current brick. Again, new bricks are only added when prices completely “fill” the brick. For example, for a 5-point chart, if prices rise from 98 to 102, the hollow brick that goes from 95 to 100 is added to the chart BUT the hollow brick that goes from 100 to 105 is NOT DRAWN. The Renko chart will give the impression that prices stopped at 100. More example, a 10 pip Renko chart would plot the bricks when price moves (and closes) 10 pips higher in an uptrend of 10 pips lower in a downtrend. One of the distinctive advantages Renko charts have to offer is the fact that they are not time dependant. Therefore, new Renko bricks are plotted only when price moves up or down for the specified number of pips.